With the end of Brisith Summer Time upon us this weekend many brides will be turning their attention to sending out ‘Save the Date’ cards and planning 2017 wedding invites. At Daisy Chain HQ, we’ve turned our attention to updating our wedding stationery range, website and even our logo, to bring you even more selection. This week’s blog is bringing you a selection of our new wedding stationery ranges. Finally, don’t forget that all of our stationery is produced on high quality card and is dispatched within 3-4 days from signing off your artwork. Whilst there are many stationery suppliers out there, be sure to check customer reviews and ensure that your chosen supplier is a reputable business so that you don’t risk disappointment with your order. 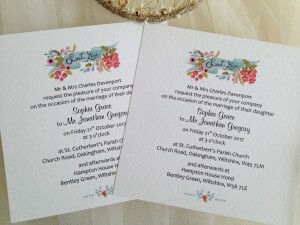 Description: Our Perfect Match Wedding Invitations are an attractive square personalised wedding invitation supplied on a thick heavy weight hammered card and they are available in either white or ivory. This wedding invitation features a contemporary eye catching thumb print heart design and the bride and groom’s names. Why we love it: This invite is a lovely modern design of contemporary typefaces and thumb print heart, designed to symbolise the Bride and Groom’s finger print joining together. 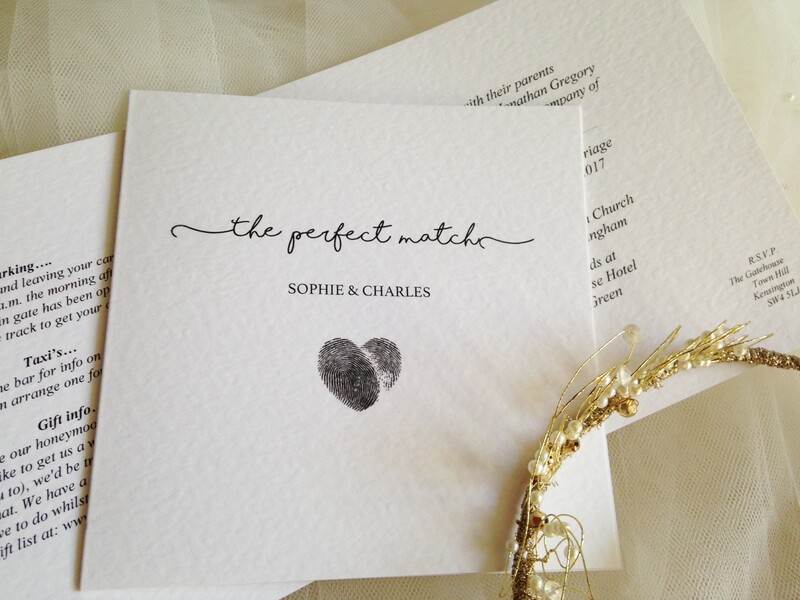 Perfect for: The Perfect Match invite is great for any style or theme wedding due to its simplicity and elegance. We can also print the text in any colour to match your colour scheme. Price: From £1.25 per invite which includes free guest name printing and matching envelopes. Shop Now: To purchase our Perfect Match Wedding Range click here. card which is available in white or ivory. Why we love it: Our favourite Spring and Summer wedding trends have focused around informal styles and delicate details which this range beautifully complements. Perfect for: Our Sweet Love Wedding Invitations are on trend for informal country themed weddings, including village fete or ‘tea party’ wedding themes which continue to be hugely popular. 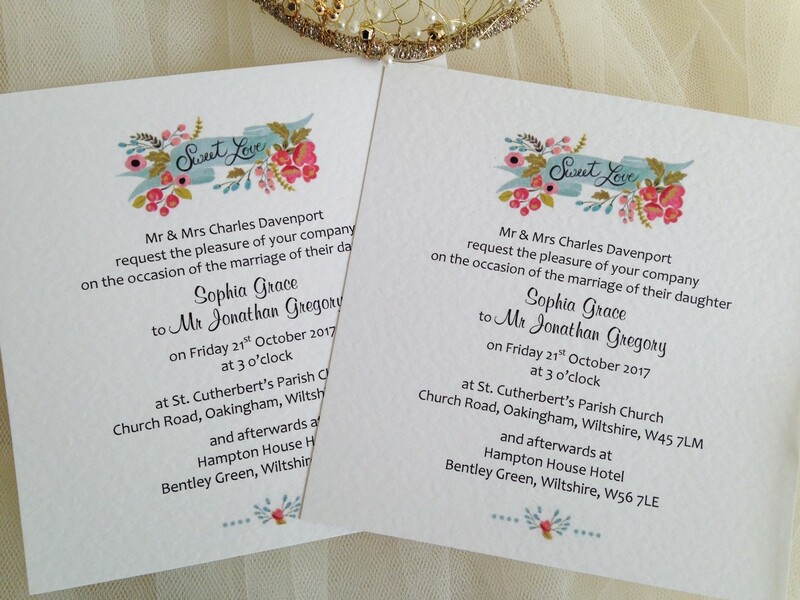 Price: From £1.10 per invite which includes free guest name printing and matching envelopes. Description: This delicate square centre fold wedding invite features soft green leaves, interspersed with pale pink and lilac flowers to reflect country flowers. Why we love it: This simple, yet elegant range of stationery is available with satin or organza ribbon which can be a great way of tying your wedding colour scheme in with the wedding stationery. Perfect for: Our Woodland Wedding Invitations and Stationery are perfect for a rustic, woodland or forest themed wedding, this clean, crisp wedding invitation design features a delicate watercolour wreath illustration. Price: From £1.25 per invite without ribbon, £1.50 with organza ribbon and £1.70 with satin ribbon. 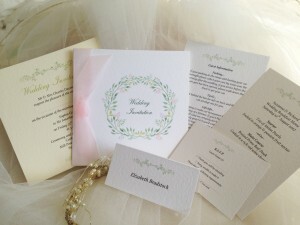 These prices include print in a range of font, free guest name printing and matching envelopes.